David Hutchinson’s comic adaptation of Beowulf, a three-issue run that was published in 2006, imposes modern themes onto the basic plot of an ancient story. When Hutchinson pulls the story forward into a futuristic setting, he reimagines the character of Beowulf as a modern antihero, making him prioritize knowledge and personal gain over honor. This may not have been his intention—in fact, in the author’s note at the beginning of the first issue, he seems to idolize the original Beowulf, saying that “I was raised on superheroes, and I view Beowulf as one of the very first of that archetype. All on his own, using nothing but his own two mitts, he rescued an entire kingdom from a merciless fiend that had held the king and his subjects under siege.” However, throughout his adaptation, he presents us with a decidedly less heroic Beowulf, whose priority is not to rescue the kingdom but rather to avoid his own rapidly approaching death. This new Beowulf leaves aside the Old English value of loyalty to one’s lord, and is instead defined as a mercenary who steals information and has, on at least one occasion, killed an employer for a slight to his honor. Hutchinson pits this new Beowulf against a Grendel who owes his existence not to Cain but to government experiments and Hrothgar’s own attempts to beat death. In doing so, he removes all religion from the equation, turning the story into a battle between the hubris of Beowulf and the power-hungry Big Brother that is represented by Hrothgar. The first image we see of Beowulf in this adaptation is the cover of the first issue. This image seems carefully designed to tell us a number of things about our main character. His clothing shows that Beowulf has been placed in a sci-fi type setting. Moreover, the color scheme—black and white and red—along with the wreckage on the ground hints at a dystopian, or at the very least unstable, society. Beowulf is a warrior, fists clenched and scarred brow furrowed. His white skin, coupled with the partial concealment of his face and the almost chitinous spikes protruding from various parts of his body, give him a monstrous appearance—and a visual parallel with Grendel that I’ll explore later on. 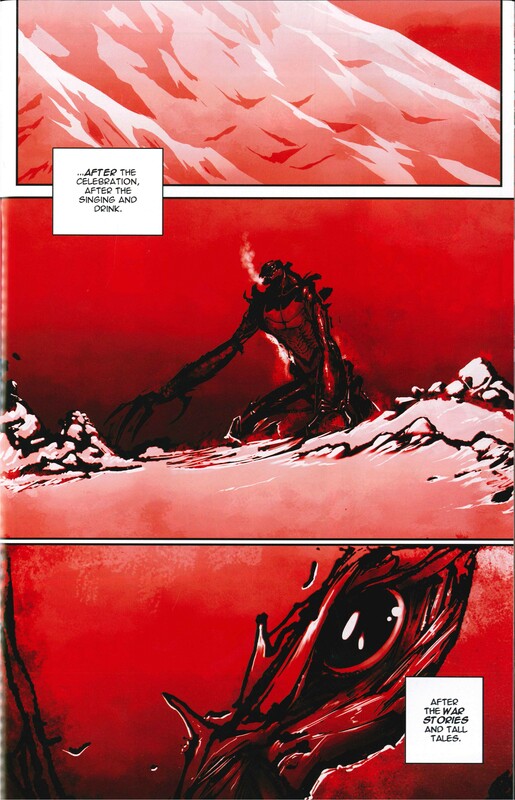 One of the most effective things Hutchinson does in his adaptation is to use the comic format to visually connect Beowulf to the monsters. The first issue of the comic is dedicated to exposition about this futuristic world and to the beginning of Beowulf’s fight with Grendel. In this setting, Beowulf is an “advance”—a person who has been upgraded into an advanced soldier, with the unfortunate side effect of a vastly shortened lifespan. Beowulf lives in a sort of mechanical cocoon except for when he is fighting or establishing his contract with Hrothgar, making him a perfect warrior who can not be anything other than a warrior. This is an interesting concept, and actually works fairly well with the Beowulf from the original text, a Beowulf whose main characteristic was his prowess in battle. However, it also simplifies the original character; one couldn’t imagine Hutchinson’s Beowulf stepping back from battle to lead a nation for 50 years, as the Geatish hero does. This period of exposition also gives us our first description and image of Grendel. In the Old English Beowulf, Grendel is introduced to us as “a powerful demon, an outcast.” (88) The first image we see of Grendel conveys quite effectively a sense of both power and isolation—the flow of the page moves from a barren landscape, to Grendel alone and huge on that landscape. This isolation and power, combined with the visual cue of their identical color schemes, serves to link Grendel and Beowulf. After the exposition comes the first part of Beowulf’s fight with Grendel. 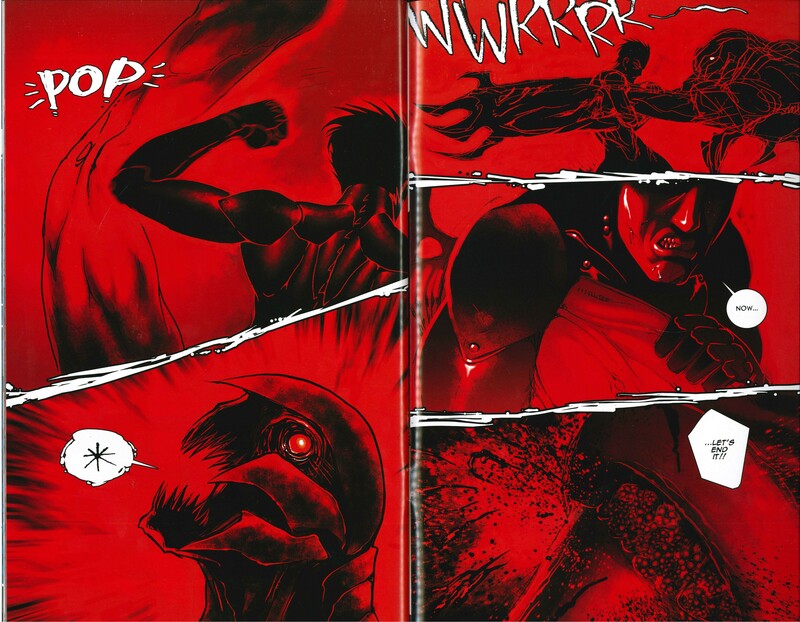 The black/white/red color scheme that appeared in the first cover image returns along with Grendel, but this time he is sharing it directly with Beowulf, two dark figures against the red. In the original poem we understand the relationship between Beowulf and Grendel through key lines; in the comic Hutchinson emphasizes this relationship through his use of color. The fight is fairly unimpressive, only spanning a few pages, although it is interesting to note that Grendel succeeds in throwing and wounding Beowulf. In the last few pages of the issue, one could almost come to pity Grendel—when Beowulf pops one of his joints, we see Grendel let out a cry of agony, and although Grendel has monstrous teeth for devouring human flesh, in the end it is Beowulf who bares his teeth as he rips Grendel’s arm off. However, unlike in the original text, this isn’t the end of Grendel. Grendel takes Beowulf’s. The two of them are no longer just thematically linked—they have each taken a part of the other, and in doing so have crafted a reciprocal bond. The fact that Beowulf gets back up after being stabbed through the chest and dismembered truly speaks to his monstrous nature—just as his one-armedness makes him a kind of Grendel, and thus more monstrous. Personally, I feel that Hutchinson’s handling of the Grendel/Beowulf parallel is a bit heavy-handed (excuse the pun). However, it did allow for what is absolutely my favorite moment in the whole series. Rather than Grendel’s arm being hung in Heorot as a sign of Beowulf’s victory, it becomes a part of Beowulf himself, and is put to a practical (as opposed to symbolic) use. The other major thing that Hutchinson changes in the second issue is Hrothgar’s identity and role in the story: he transforms Hrothgar from a tragically impotent lord to a full-on villain. This transformation is prompted, I think, by the desire to add a modern theme to this ancient story. 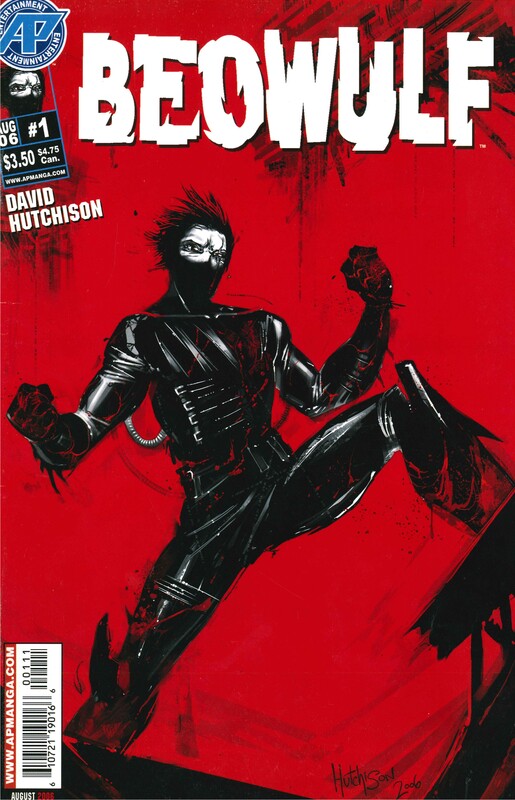 The comic’s main concern is the danger of an all-powerful government, a danger that Grendel comes to represent through his existence as an experiment. Hrothgar represents through his willful concealment of information (specifically, information about the super-soldier project and about Beowulf himself). In making Hrothgar the driving force behind the events surrounding Grendel’s attacks, Hutchinson is turning Beowulf from a story about protecting society from external threats into a story about one supernaturally powerful man fighting against a corrupt and tyrannical regime. Essentially, he turned it into Star Wars. And on that note, we move on to the third issue, in which Beowulf ventures deep into the enemy’s isolated base, where Hrothgar is constructing an all-powerful weapon. Beowulf makes his way inside and blows it up. Is this sounding like A New Hope to anyone else? It is here, in Hrothgar’s base, where we meet Grendel’s mother. It’s hard to tell whether she’s fully human, whether she’s even wearing clothes, but she clearly isn’t the mother from the poem. She has been removed from her own hall and placed into Hrothgar’s, and she exists in this version of the story to satisfy the need for eye candy and to deliver more exposition. While in the original text she existed as a second foe for Beowulf, and possibly to point out potential issues with the feud system, in this story she exists to provide a dramatic origin story for Grendel and to carry on his legacy. It seems the fact that Grendel “made the demon class soldier possible” (aka was the predecessor to Beowulf and his supernatural strength) is supposed to explain the ties between the two of them, and even to strengthen them, but personally it did the opposite for me. After all, in the original story Beowulf is without equals. In contrast, in this story, Hrothgar offers to upgrade all of his men if he kills Grendel, simultaneously making Beowulf nothing more than a coincidental hero and showing that anyone could have that same connection with Grendel—it was only circumstances that made it Beowulf. I think the third issue bothers me so much because if Hutchinson had gone about things differently, this story could have been a really interesting way of looking at the things modern society prioritizes compared to the ideas that were prized at the time of the original text. If more emphasis had been placed on the government’s secrecy, if Beowulf and Grendel’s mother had some different relationship than Beowulf and Grendel had, if the story hadn’t suddenly dropped off at the end with a charismatic but completely irrelevant one-liner, leaving a vast number of unanswered questions regarding the nature of super-soldier technology and what Beowulf intends to do next, the series would have had (in my opinion) much more value. And don’t get me wrong, the story was very entertaining! The art was nicely stylized and dramatic, the plot was easy to follow in spite of its changes to the original, the first couple of issues were really very entertaining, and the flow of the story was very nice. It just also demonstrates some of the unfortunate parts of modern pop culture—it shows that in modern times, the way a hero gets stronger is by getting bigger and bigger guns, and that family intrigue, flashy special effects, and essentially naked women are more entertaining to us now than characters with actual dimensions and motivations. I only wish that Hutchinson had chosen to go another route than melding Beowulf with the worst aspects of modern pop culture, because if he could make such an entertaining work while including all of these less-than-innovative tropes, I would have liked to see what he could do if he let himself be more creative. —Eve Lyons-Berg ’17 is an intended English major with a frankly unhealthy interest in fantasy and pop culture tropes. The fantasy part drew her to Beowulf (taking a detour through Tolkein on the way), and the pop culture part made her quite curious as to how a sci-fi adaptation of Beowulf would work.